Treats for Baby Tuesday: CVS Baby Formula, Gymboree, H&M + More! Get 23-oz. 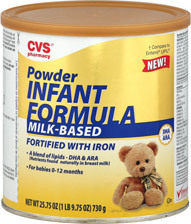 cans of infant formula for $6.24 this week at CVS with this baby formula deal! Use this Old Navy printable coupon to save $5/$25 or more in purchases in stores. There are a few Stride Rite printable coupons to save up to 25% on your in store purchases! Bring this OshKosh B’Gosh printable coupon to your store and save 25%/$40 or more in purchases. Gymboree’s Fill-A-Bag sale is on right now! Shop online or in stores and save 30% on everything! CVS-brand baby formula is B1G1 50% off. Get baby formula for $6.24 per can! Pampers Splashers and Huggies Little Swimmers are B1G1 50% off. Huggies Jumbo Packs are on sale for $9.49 (Jean diapers are excluded). Select tubs and cans of Gerber, Enfamil are $22.99 ea. CVS-brand diapers and wipes are B1G1 50% off. Get $3 in +UP Rewards wyb 2 select Similac Baby Formulas or Pedialyte. Jumbo packs of Tugaboos Diapers are 2/$15. Submit a Rite Aid SCR to get $3 cash back wyb two. Huggies Little Swimmers are B1G1 50% off. Use this printable coupon to save $1 on Huggies Little Swimmers. Spend $30 on select items including $11 Jumbo Packs of Huggies Diapers, Overnights and Trainers and you’ll receive $10 in +UP Rewards at checkout. Rite Aid Baby Care items are B1G1 50% off. Huggies Little Swimmers are $6.99 ea. Find a $2 off coupon in stores and get them for $4.99 each. Use this printable coupon to save $1 on Huggies Little Swimmers. Jumbo packs of Huggies Diapers are $8.99 ea. Select big packs of Huggies Diapers are $19.99 ea. Jumbo packs of Pampers or Huggies Diapers and Trainers are 2/$18. All Up & Up baby foods are 10% off. Super packs of Huggies Pull-Ups are $24.94 ea. 700-ct. pks. of Parent’s Choice Baby Wipes are $11.97 ea. Use the in-ad coupon to save $4 on any two 22.2-oz. or larger powder baby formulas. Get a FREE pack of Pampers Sensitive Wipes wyb any limited edition Pampers USA Cruisers. Buy any two mega packs of Pampers or Huggies Diapers and save $6 at checkout. All Plum Organics single food pouches are 10/$10.